Craft beer is so hot right now – even if the weather outside is anything but. Thankfully, one of the perks of a wild and wet Auckland winter is an extra-long session at the pub, imbibing the latest brews from the likes of Liberty, Epic, or Hallertau while you watch the rugby, because there’s literally nothing better to do when the weather is crap. So turn that frown upside down, embrace the wet weather as if it were a loved one, gather up a posse of your best mates, and check out one of Auckland’s best brew bars. You’ll be glad you did. Arguably the jewel in Auckland’s best brew bar crown, Brothers Beer is a beer lovers’ mecca inside central Auckland’s City Works Depot that boasts more than 200 beers, including a revolving range 18 craft beers on tap. It does pizza, too, but if you plan to pair food with your beersies, then you’re better off heading to the other Brothers Beer in Mount Eden, Brothers Juke Joint on Akiraho Street, where you can pig out on tater tots, beef brisket, pulled pork and other deliciousness from its exceptional barbecue menu. Fortune favours the bold as well as the indecisive at The Beer Spot on Auckland’s North Shore – though the former may need some assistance with choosing a beer from the 40 on tap. 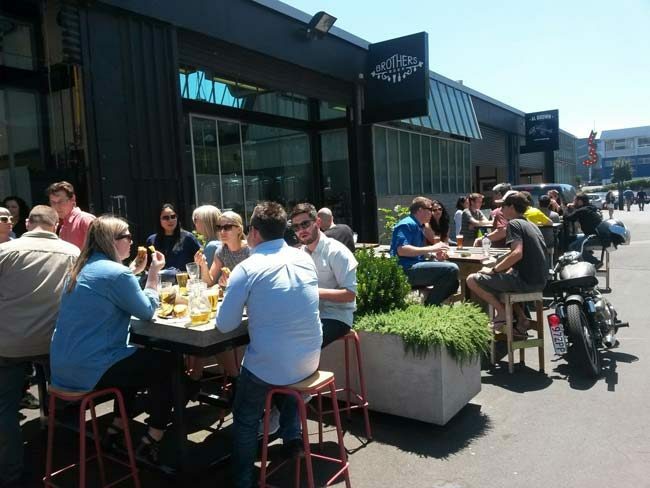 Leading the good fight against boring beer on the Auckland waterfront is 16Tun, a “free house” with an ever-changing line-up of Kiwi craft beers and ciders on tap and by the bottle. But this isn’t your bog-standard beer-loving-hipster joint. On the contrary, 16Tun has a slick, stylish interior, a solid food menu, and it even serves wine. That should keep the unenlightened non-beer drinkers in your group happy, while you partake in the good stuff. The new kid on the brewpub block, Brewers Co-operative on Victoria Street West is making up for lost time with a focus on quality craft beer from around Auckland and the rest of the country, as well as gourmet food. Indeed, the Co-op’s fresh-caught fish and chips might be some of the best you’ve ever had in Auckland. Plus you can order fresh oysters by the half shell, scallops, deep-fried anchovies, and a range of gourmet burgers. With brew bars in Browns Bay, Orewa, and Waiheke, Deep Creek Brewing has beer lovers covered in some of Auckland’s most glorious summertime spots. But its own range of craft beers also go down a treat in winter – as does its comprehensive menu of winter warmers, taco tempters, and sweet treats.